Diary of a Pro-life Girl: Who decides who dies? The Rasouli Case is creating a storm in Canada. Hassan Rasouli fell into a coma after brain-surgery complications in October 2010. One month later, the medical team caring for him determined that he was in a persistent vegetative state, and told his family that the best course of action would be to remove his ventilator and feeding tube. His family disagreed. Rather than referring to the Consent and Capacity Board, as is usually the procedure, the medical team took the Rasouli family to court. The case has worked its way all way up to the Supreme Court, with the doctors arguing that it should be their decision alone on whether or not to continue treatment. In the meantime, Hassan Rasouli has shown signs of consciousness, vindicating the Rasouli family. However, many people still believe that Hassan Rasouli should be starved to death - in spite of his family's objection, in spite of his marked improvement, and in spite of his religious beliefs. That this is an issue is a frightening reflection on Canadian views of palliative care and patient autonomy, and every Canadian should be paying attention to the outcome of this case. Go to Euthanasia Prevention Coalition, who has intervener status on this case, for a great analysis. Read a recent article from the Toronto Sun. 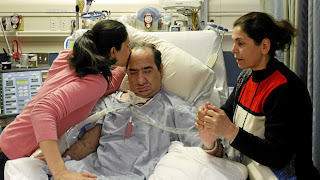 Please help fund Hassan Rasouli and his family as they battle in the Supreme Court of Canada this fall in an attempt to stop Hassan’s own doctors at Sunnybrook Hospital from ending his life. This decision will effect everyone in Canada in the future and the family needs our support now. Just a note guys, I have not checked the link to make sure it is legit. Just go to Euthanasia Prevention Coalition for updates on this and other important cases around the world!